Falafel is a huge hit in Mediterranean restaurants, and it can even be found in food carts across the country. If you haven't been formally introduced to this culinary staple of the Middle East, we're here to tell you that you're missing out. Falafel has even been called the national dish of Israel, where it's a popular street food. Though its origin is a subject of debate, we know that this delectable dish has been around for thousands of years. It likely originated in Egypt or India, and it was later embraced by Jewish people in Syria, Yemen, and Egypt. Yemeni Jews brought the dish to Israel in the '50s, and today it's almost as popular in the Western world as it is in the Middle East. However the question remains: What exactly is falafel? The name "falafel" refers to falafel balls. They look like large meatballs but are actually made from chickpeas or fava beans (or a blend of the two). The fava bean variety is the more traditional recipe, while chickpeas—also called garbanzo beans—are more commonly used in modern recipes. In a typical preparation, the beans are soaked, finely ground, and then seasoned with scallops, onions, and a range of spices like garlic, coriander, cumin, and parsley. The ingredients are then rolled into balls and deep-fried using incredibly hot oil, which provides the crispy outer texture falafel is known for. Once the falafel balls have been fried to perfection, they may be wrapped in a pita shell and served with a medley of sliced veggies like tomato and cucumber. For the finishing touch, they may be topped with hummus and tahini. A spicy Yemeni sauce can also be added to traditional-style falafel balls. If falafel is the main entrée, it may be served with a salad, a side of German sauerkraut, fried eggplant, or even French fries. One of the great things about falafel is that it's 100% vegan. The meat variation of falafel is shawarma, which is commonly made with lamb that's roasted on a spit and finely shaved. Aside from being vegan, falafel does have additional pros and cons to consider in regards to nutrition. On the one hand, it's an excellent source of vegan protein; however, 47% of its calories come from fat. Also, let's not forget that it's deep-fried. A falafel pita can have up to 1500 grams of sodium and 750 calories, so it's a good idea not to overdo it. If you'd like to make your falafel a healthier, prepare it in canola or olive oil, and swap the traditional pita for whole wheat. 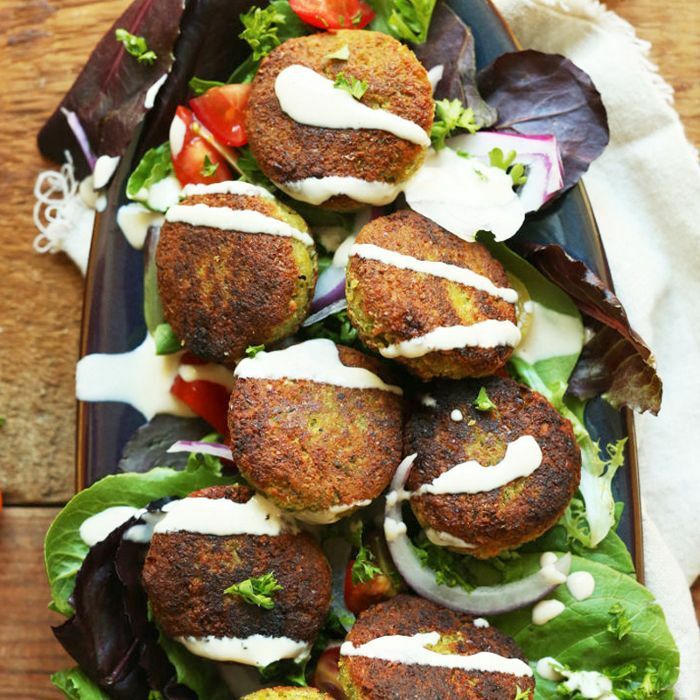 Falafel is also extremely versatile and can be adapted to other recipes. This falafel burger recipe is easy to prepare and is much healthier than a traditional beef burger. If you're still curious about the falafel phenomenon, now is a great time to head down to your local shawarma stand and discover what all the fuss is about. What Is Pesto—and What Should You Serve It With? What Is Ghee, and How Do You Make It?